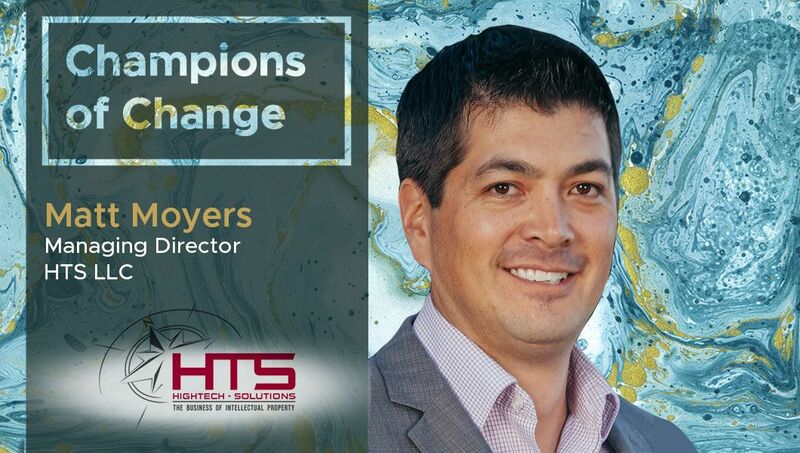 Matt Moyers: HighTech-Solutions is an intellectual property (IP) consulting firm that specializes in helping companies and inventors understand the market value of their IP and patents. Our team of subject matter experts identifies patents that are utilized in the market place and our financial experts assist with monetizing those assets through a variety of methods such as sale, license, joint venture, capital raise, M&A support, bankruptcy, or litigation. Matt Moyers: There are literally hundreds of thousands of IP and patents assets throughout the world. I would make this analogy: IP and Patent consulting is on a slow-row boat in a bay while the digital transformation is on speed boats all around us. We watch the fast-moving technology invention and innovation all around us, but the actual process of analyzing patents is esoteric and lacks innovation that directly impacts my day-to-day effort. That said, improving technology solutions within the intellectual property space is a costly endeavor that requires using new technologies like Blockchain, Artificial Intelligence, Data Mining, and Predictive Analytics. In this regard, having a broad external network of similar professionals to partner with is critical to expanding my business. Matt Moyers: It is hard to pick one out of Blockchain, Artificial Intelligence, Data Mining, and Predictive Analytics. However, AI is probably the most important in the short-term given the volume of data that exists within intellectual property, but blockchain is more important in the long-term for contractual and efficiency of monetization purposes. Matt Moyers: SaaS platforms for analyzing large data sets of patent information is critical for IP professionals who deal with large volumes of patent portfolios. At HTS, we use SaaS systems like Acclaim IP, Innography, and Thomson Patents. Many other market players have been developing similar types of SaaS systems, but none have distinguished itself as significantly better than the other. A clear market leader (or leaders) have still yet to emerge. That said, HTS is also highly reliant on less efficient systems like Microsoft Office and Google Drive. As a small business, we need to be selective about technology we adopt and sometimes the older, but known technology allows for a routine and process to be followed across the firm. Matt Moyers: No, HTS outsources its IT for the most part. This presents challenges in that the team must resolve issues by working around challenges. Matt Moyers: CRM is the most immediate issue we face. Executing on projects for our clients is something we do very well at, but keeping a pipeline of opportunities is the challenge. Further, a CRM that flows through to managing project execution would be very helpful, but we have a hard time justifying the high cost of those types of SaaS services. It would eat into our margin too much or it would force us to raise our pricing beyond what our customers would be willing to pay. Accordingly, we stick to spreadsheets and email. This is part of the “work around” I spoke about earlier. Matt Moyers: No, our services do not fit that model. Matt Moyers: LinkedIn and Twitter are essential to HTS’s business for both networking and information purposes. LinkedIn helps to foster a broader networks, while Twitter provides the latest information from within that network. Facebook and Instagram are of no help to our business.